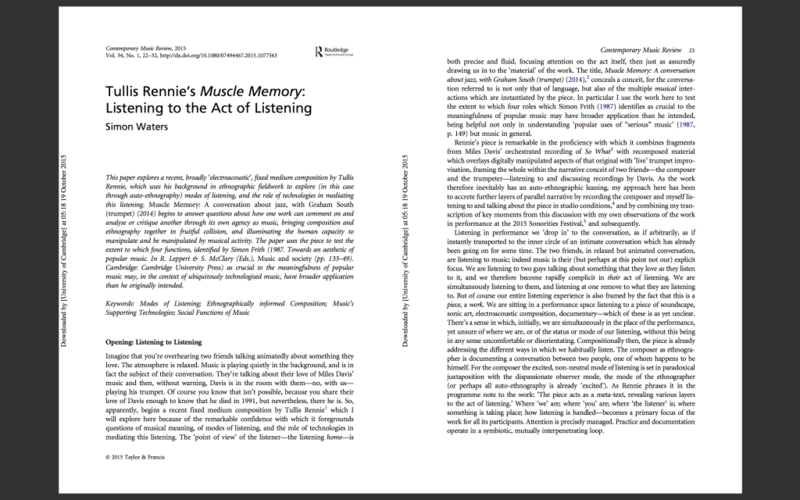 Abstract: This paper explores a recent, broadly ‘electroacoustic’, fixed medium composition by Tullis Rennie, which uses his background in ethnographic fieldwork to explore (in this case through auto-ethnography) modes of listening, and the role of technologies in mediating this listening. Muscle Memory: A conversation about jazz, with Graham South (trumpet) (2014) begins to answer questions about how one work can comment on and analyse or critique another through its own agency as music, bringing composition and ethnography together in fruitful collision, and illuminating the human capacity to manipulate and be manipulated by musical activity. The paper uses the piece to test the extent to which four functions, identified by Simon Frith (1987. Towards an aesthetic of popular music. In R. Leppert & S. McClary (Eds. ), Music and society (pp. 133–49). Cambridge: Cambridge University Press) as crucial to the meaningfulness of popular music may, in the context of ubiquitously technologised music, have broader application than he originally intended.